Beautiful Crab, Nautical Anchor, Primitive Whale Designs. Rustic, Modern, Artistic Beach House Decor at it's Best. This is the ultimate Coastal Decor Christmas Stocking. The inside of the stocking is fully lined. This stocking would be perfect to hang even if you do not have a beach house and just looking to have a coastal Christmas theme. Measured along the diagonal from the top left hand corner to the toe, the stocking measures 21 inches, and the width along the cuff is 8 inches. This stocking is fully lined inside. Materials: Nice quality canvas, reminiscent of sail cloth. Lining: Yes, this stocking is lined inside. 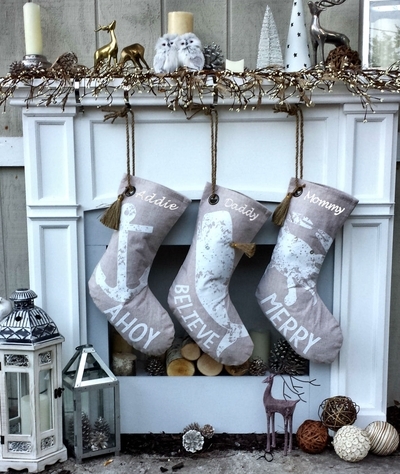 Names can be personalized on the top of the stocking with embroidery thread which will compliment the overall design and color scheme of the stocking. Embroidered with Gold Metallic Thread - ONE WORD ONLY Each name is machine embroidered with the first letter in upper case and the remaining letters in lower case.